Հայաստանում տոլման ամենատարածված և ամենահայտնի ուտեստներից մեկն է, ինչի պատվին կազմակերպվում է ամենամյա խոհարարական միջոցառում՝ «Տոլմայի փառատոն»: Սովորաբար այն մատուցում են մածունով և ճզմած սխտորով: Որպես համեմունք՝ տոլմայի մեջ հազվադեպ օգտագործում են նաև ընկույզով, սնկով և բալի սոուս: Տոլմայի պատրաստման համար կիրառվում է մսի 3 տեսակ՝ խոզի միս, տավարի միս և ոչխարի միս: Ինչպես նաև օգտագործվում են բարկահամ խոտաբույսեր՝ ռեհան, խնկածաղիկ, թարխուն: Տոլմայի պատրաստման համար անհրաժեշտ տերևները (թփերը) պետք է լինեն ամենանուրբը և ամենամատղաշը: Կիրառվում են թե՛ խաղողի, թե՛ կաղամբի թփեր: Ինչպես նաև գոյություն ունի տոլմայի մի տեսակ, որը հայերն անվանում են «պասուց տոլմա» (ռուս.՝ пасуц толма), որն իրենից ներկայացնում է պահքի համար նախատեսված տոլմա, որի միջուկն են կազմում ոսպը, կարմիր լոբին, սիսեռը, ցորենի հատիկավորները, տապակած սոխը, տոմատի մածուկը: Բացի վերոնշյալից, Հայաստանում գոյություն ունեն նաև տոլմայի հետևյալ տեսակները՝ դդմի ծաղիկից, թզի տերևներով, խեցգետնի մսով, ինչպես նաև հավի մսով և ձկով: Երևանյան տոլմայի՝ խաղողի թփերով պատրաստման եղանակը. խճողակը պատրաստվում է ոչխարի մսից (մատղաշ), բրնձից, մանր կտրտված սոխից, կանաչուց, պղպեղից, որը փաթաթում են նախապես պատրաստված խաղողի թփերի մեջ՝ գլանի ձև ստանալով: Կաթսայի հատակին դնում են փափուկ մսից գեռացված ոսկորները, ապա կիպ շարում են տոլման, ավելացնում մի փոքր արգանակ և ծածկում են կափարիչով, եփում թույլ կրակի վրա՝ մինչ պատրաստ լինելը: Առանձին մատուցում են աղով և սխտորով համեմված մածունը. ↑ 1,0 1,1 1,2 Матеріалы для сравнительнаго и объяснительнаго словаря и грамматики / И. И. Срезневский. — Издание II Отделения Императорской Академии наук. — Санкт-Петербург: Типография Императорской Академии Наук, 1854. — Т. 1. — С. 85. ↑ Encyclopaedia Iranica. Dolma. 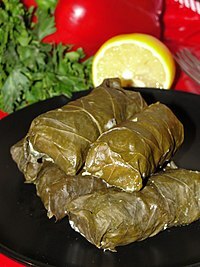 :«DOLMA (or dūlma), Turkish term (Doerfer, III, pp. 203-04) for stuffed vegetable or fruit dishes common in the Middle East and in Mediterranean countries. Versions have been known in Persia since at least as early as the 17th century (Afšār, pp. 217, 238-39)». ↑ А. С. Пирузян. Армянская кулинария. — М.: Госторгиздат, 1960. ↑ Gerhard Doerfer, The influence of Persian language and literature among the Turks // The Persian Presence in the Islamic World. — С. 240. Yoghurt, stuffed vine-leaves (dolma), kebabs, shawarma, and baklava, amongst many other well-known foods, all originate with the Turks (though Turkish coffee does not). And if the story is true that the croissant was created by Viennese bakers in celebration of the failed Ottoman siege of their city in 1683, then – at least indirectly – we owe them croissants too. Their dolmehs, or stuffed vegetables, the Iranians borrowed from Turkey<>Minced meat is the filling for the numerous dolmasi, or stuffed vegetables, such as peppers, tomatoes, vegetable marrow, and grape leaves. Dolmas or Dolmades(Turkish cookery) - Dolmas are prepared by blanching vine leaves, draining them, and stuffing them with minced lamb and cooked rice. The leaves are rolled into balls and braised in very little stock with oil and lemon juice added. 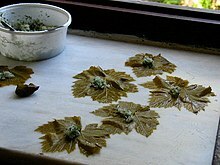 Dolmas can also be made with cabbage leaves, fig leaves or the leaves of the hazelnut tree. In Turkey, dolmas are often cooked in sheep-tail fat. Dolma is also the term used in the Middle East for a dish of mixed stuffed vegetables (aubergines, tomatoes, artichoke hearts and courgettes).